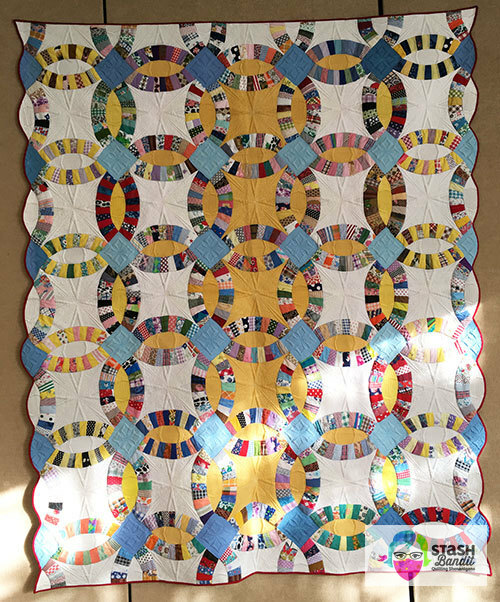 Over the weekend I saw a lot of machine quilting that challenged me to improve my skills and start working on the tops I have finished. You know how that is? 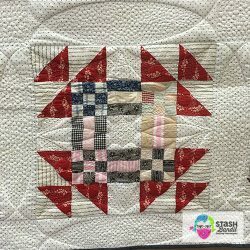 You love to piece them, but your machine quilting is less than perfect and it’s hard to figure out what to quilt on them. So the pile of unquilted tops grows. 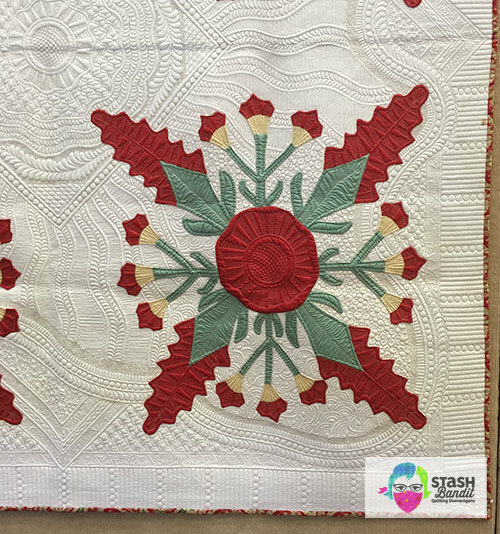 Here are some of the quilts that inspired me. They were done by Handi Quilter educators on longarm machines, which I do not have, but that doesn’t matter. It’s entirely possible to quilt beautifully on a home sewing machine. My quilting doesn’t have to be of show quality to be just fine. 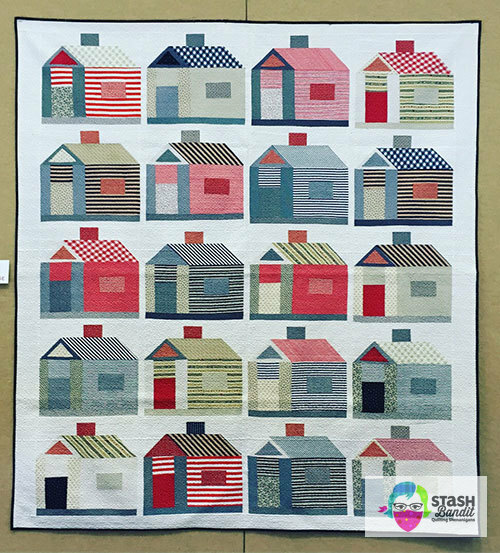 This house quilt is by Marie Eldredge. 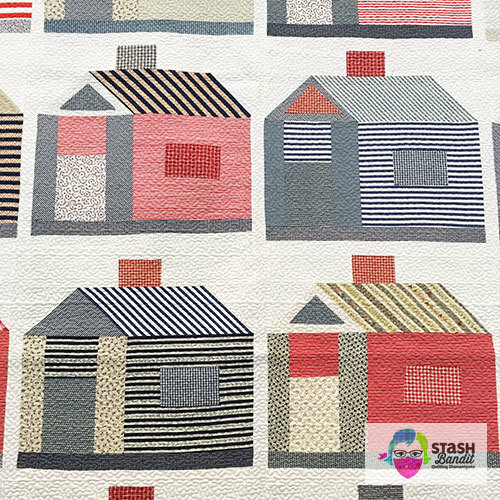 I love the quirky houses and their interesting use of fabrics. It looks all-American without being kitschy. 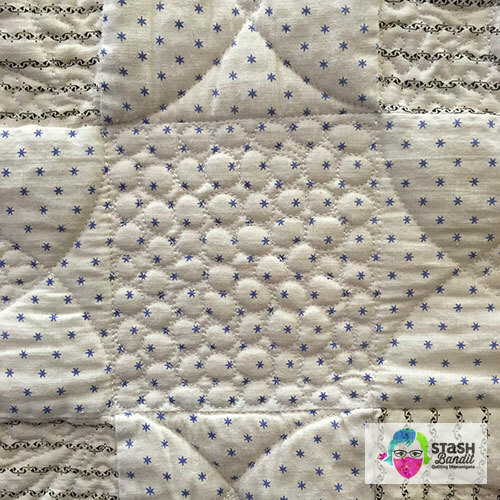 It’s quilted with a small stipple over the whole surface. Marie used it as an example of computer-guided machine quilting with the HQ Pro-Stitcher from Handi Quilter. This Goose in the Pond vintage top was quilted by Harriet Carpanini. 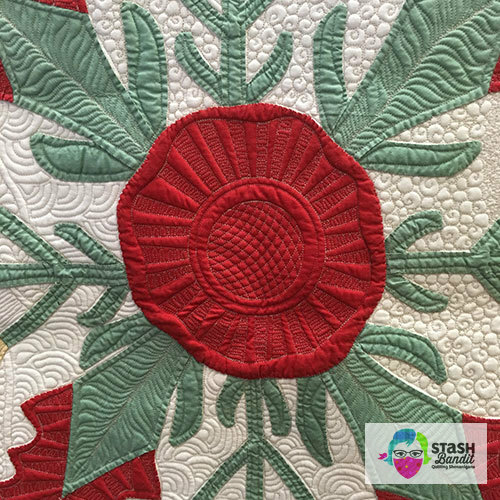 I love how the quilting adds another design element to the quilt. It’s worth noting that when you’re machine quilting, whatever you do not quilt pops up. It has some “lift” because it’s not held down by stitches. It comes forward or upward. I like these little circles. I think I could do them with some practice. 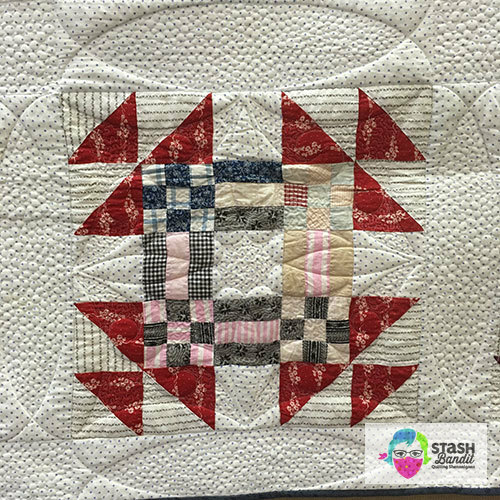 Who doesn’t love a classic four-block applique quilt? I sure do. The charm of old blocks is often in their irregularity. 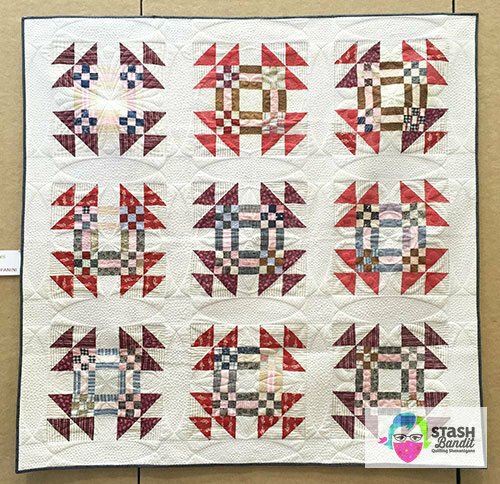 Quilters placed their applique “by eye,” for an organic look and feel. 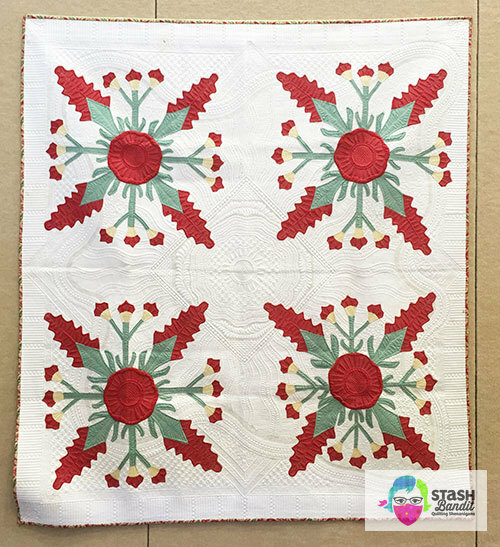 The quilting in this red center reflects that natural mood. It’s casually placed and it works perfectly. 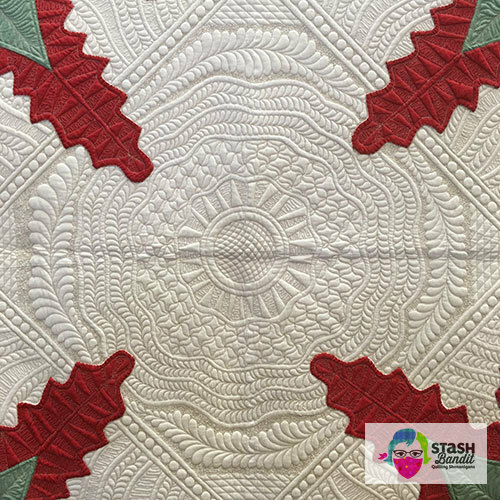 This level of intricacy may not be what I can quilt, but I can still be inspired by it. Isn’t it lovely? I am over the moon for this vintage Double Wedding Ring. I only walked by it in the mornings, so the light was washing over it unevenly, but you can still see how wonderful it is. 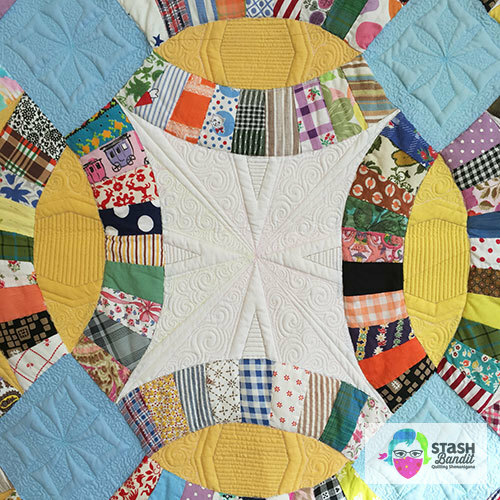 I’m not sure if someone joined vintage blocks from different makers, or if the original maker randomly used yellow fabric down the middle. Either way, I love it. 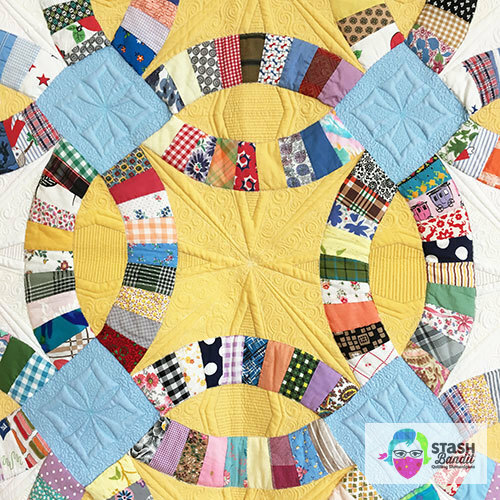 I bet she never dreamed her quilt would become home to a machine quilting extravaganza! I’m anxious to get back to my own machine and my own quilt tops. With all this inspiration, I think I can create some magic.